Update: Congrats to allsewnup #37! little treat bags, Halloween totes, and tablecloths. 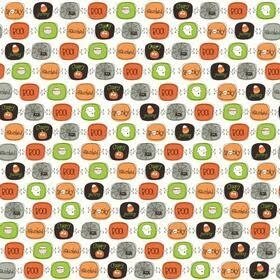 Boo to You is by My Mind's Eye from Riley Blake Designs. They say the charm packs will be here toward the end of the month. Let me know if you'd like me to hold one for you. 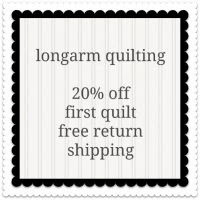 Today's giveaway is for 4 fat quarters. My favorite Halloween tradition... making my girls' costumes. Sweet potato pie with a gingersnap crust. Trick or treating with practically everyone in our town. Carving pumpkins and roasting the seeds. I think my favorite tradition is going to the pumpkin farm and taking pics and picking out the perfect pumpkin. Then it would be carving the pumpkin! We've never really done much for halloween in the past, but I decided last year that each year I would make one decoration, and eventually build up a "stash" of finished projects to decorate with each year. Oh yes, this one's much more my style. My favorite tradition is carving the pumpkins with the kiddos, and going out to dinner together after trick-or-treating. 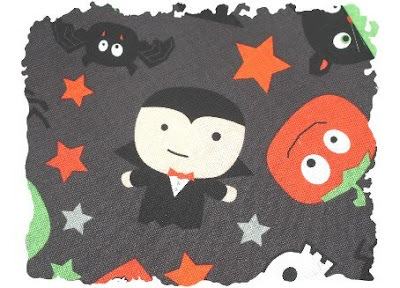 how seriously cute is that fabric, i love those little vamps. i am in australia and so don't have a halloween tradition! its not really celebrated here, i might get one trick or treater in the whole night. I grew up in Nevada, and October 31 is Nevada Day. So my favorite tradition? Not going to school! I don't live there anymore, so my new favorite traditino is CANDY! My favorite tradition is Dressing up silly for work! Of course my favorite Halloween tradition is to celebrate my birthday! Thanks for the chance. Favorite tradition: going on a haywagon ride to pick the pumpkins when the kids were little. How come they don't want to do that now that they are 20 & 17?? It's still fun? Halloween is a stressful day to me--we rush home from work, get the kids ready, try to get them fed so they don't make themselves sick on candy, and then rush back home for baths and bed, so I like the time we spend building up to Halloween instead. I wouldn't say we necessarily have a tradition...but this year my sister joined us to go trick or treating around my neighborhood since she lives out in the country and we live in town. It was a lot of fun! Ooo these fabrics are so much fun! We don't really have a Halloween tradition, but my boyfriend and I have only had 1 Halloween since moving into our first house, and we where still pooped from moving and furniture shopping. Hopefully this Halloween we'll do something, and maybe start a little tradition. I look forward to all the Halloween and Fall decorating. Never a year goes by without wrapping cornstalks around my front porch posts! Then of course, Halloween itself and seeing all the cute little monsters arrive at my door!! My favourite Halloween tradition is one that we used to do as a kid. Since my Mum and I lived in an apartment building until I was 12, we would go to my grandparents neighbourhood for trick-or-treating - it was always such fun to show my costume off to them and to find hot chocolate waiting when I returned. i love our tradition of trick or treating with my dad. i love how much he enjoys the kids, the walk, the candy...i remember him taking us as kids, and now he takes all his grandkids. love it! My favorite Halloween tradition was to come home with all my loot, dump it on the floor and wait (impatiently) for my parents to inspect it and deem it safe for eating. Unfortunately, I'm too old for trick-or-treating now and live on a busy, busy road so don't even get to hand out candy at home. 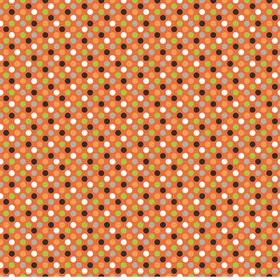 These fabrics are absolutely adorable and I would have a blast working with them if I am lucky enough to win them. Thanks for the chance! All the spooky decorating and seeing the faces on the youngsters when they are trick or treating. Oh my GOODNESS! That would be TOO perfect for treat bags for my soon-to-be-3-year-olds. We're in the process of creating traditions with our kids. Last year was the first year they went trick-or-treating. cute! after our halloween/harvest party extravaganza, we like to count all the candy and then eat 5 pieces. the kids get so into the counting and then the choosing. I love making costumes. It started with my boys and now I get to do it for my grandkids. No store bought costumes for us. Love this material. Please save me a charm pack. My favourite tradition is emptying the kids bags at the end of the night and seeing their eyes get so big. I don't know that we have a favorite Halloween tradition but one Halloween we just moved to the country and well..didn't take the boys out, instead I gave them a treasure hunt on the property...that was alot of fun. I don't really have a Halloween tradition but I enjoy the crafts and fabrics that go along with this holiday - pumpkin carving, etc. It makes it fun to decorate the house in October. My favorite thing to do is eat! I love the caramel dipped apples, donuts, etc. Dressing up is a close second. Hopefully, my little man will actually dress up this year. He only wore his t-shirt that said "O'Lantern". (His name is Jack). . and by the way, I LOVE THE GHASTLIES!!!! Favorite Halloween tradition....raiding the candy bowl! Carving the pumpkins to look like the kids toothless smiles. :-) Always fun times! Our grandchildren took turns coming to our house and giving out the treats to the tricksters- of course they ate lots also. I had a old gnarly Christmas tree that I spray painted black and we have a Halloween tree with spooky ornaments and lighted eyeball lights. 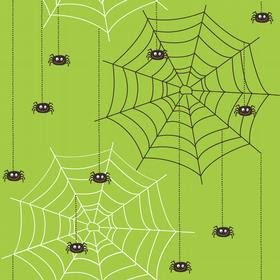 I love the lime green spiders!!! Our favorite tradition is for all of the grandchildren to come over on Halloween. We have a big pot of chili and then they go out trick or treating to our neighbors. It is wonderful. My favorite halloween tradition is making my son's halloween costume. I imagine it will be more difficult has he gets older and has actual demands on what he wants to be instead of whatever I think it cute! We decorate for Halloween almost as much as we do for Christmas! Chocolate chip pumpkin bread, matching Halloween shirts from Target and a trip to Disneyland are October musts! Pumpkin carving with my kids. It used to be me doing it all but now that they're older they want to do it all and the results have been alot of fun. My boys are so proud of themselves when they've completed their masterpieces. A Halloween tradition growing up was going to my Grandmother's neighborhood to go trick or treating. lots of kids from my school lived there and it was fun to go TrT with them in a big group. I have since started taking my daughter there to TrT. She loves it! I always love going trick or treating with the family. We always have a great time. My favorite tradition...Our town's Spook Parade. I am now helping and watching our Granddaughter parade down Main Street in costumes with the rest of the towns' children. 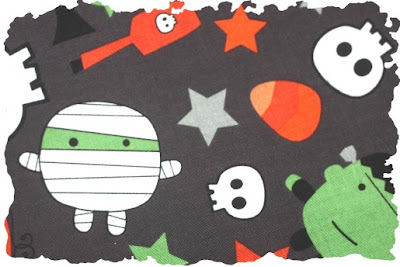 That Halloween fabric is the cutest! My favorite Halloween memory is when were little and lived on the farm, we dressed up, ran around the house, knocked on the door, said trick or treat AND REPEATED, over and over!! Okay, first I just have to say that I did not love the Ghastles. But I do love this cute fabric! It is adorable. My favorite Halloween tradition is carving the pumpkins. Our kids are grown now, but we always made a fun night of doing the carving. My son always made a scary, mean one, and the girls always made cute ones. So fun. Last year I got to do it with the Grandkiddies! That was fun too. Nasty little cough you have there. LOL! 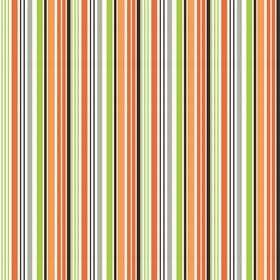 Okay from this line I realllly like the stripe and the dot is cute too. If my number comes up please draw again. :D My favorite Halloween tradition is NOT HAVING TO OBSERVE Halloween anymore!!! I think maybe it was because my parents overdid it. I have 'some' fond memories of Halloween at home but it is just not the holiday for me. Unless there are donuts and apple cider involved. My son does love to do some cool pumpkin carving so I guess that would be the best part about Halloween. 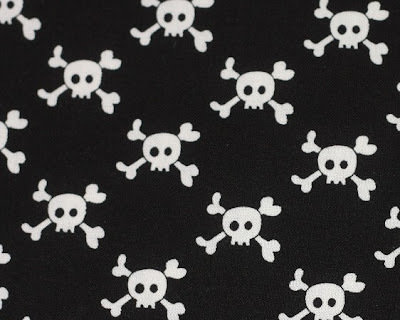 Oh I like the skulls and crossbones! I really do love carving pumpkins despite the fact that it is a mess and a pain. My good friend and I also have a tradition of making pumpkin food from our leftover Halloween pumpkins which is a lot of fun. Thanks for the darling giveaway. As a child, of course, I loved to go trick or treating and get candy. Now I love to see my girls enjoy Halloween parties, carving pumpkins, and picking out their costumes. We have a million Halloween traditions- carried over with my children from when I was a little girl. First, a visit to the fabric store pattern books with Grandma to pick costumes, which she then sews for all 8 grandchildren. On Halloween night, my dad comes with me to take the kids trick or treating- we live in a farm area, so basically we drive from house to house. Our top priorities are visiting elderly folks- many who I visited as a child because they were friends of my grandparents. Some of them only get one or two visitors on Halloween. It's so much fun, because they are really excited to see my kids. After we finish trick or treating, we head back to my mom's house, where she has a creepy Halloween meal prepared. We love Halloween. Sorry to write a book. For the record, I loved the "Ghastlies!" For me it is carving pumpkins. My husband is in English and he is finally getting into the whole thing. Our daughter is almost 6, so I guess soon we'll be working her into the knife wielding tradition. i remember halloween as my favorite! but i hope one day to go back to the stats and celabreter halloween again! My favorite Halloween tradition is to put a boom box in the window on Halloween night and play a tape with creepy Halloween sounds (very loud)so the little goblins won't know what to think! And dress up when I come to the door. So cute! I like walking the streets with my kids as they trick or treat. Each year we pick out pumpkin seeds and plant them in our garden. It's a lot of fun watching them grow. We also get pumpkins from the pumpkin patch and have a blast carving all of them. Wow, Is this international? I LOVE them! I love the dressing up & taking pics with funny poses! My favorite Halloween tradition is making (and eating!) caramel corn. YUM! Thanks! As a child I loved making caramel and chocolate covered popcorn! Oh and some yummy hot chocolate for when you get home from trick or treating :) can't wait for my little one to be older so we can making yummy treats together! Soft caramel popcorn balls! We make them every year for trick or treaters. I love that we live in small town and can give away homemade goodies to kids trick or treating. 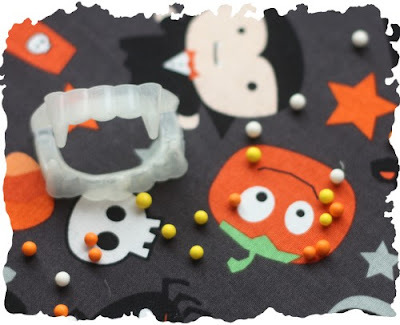 We wrap them up in little bags and tie off with strips of black and white polka dotted fabric and a plastic spider. So cute! Love the spiders and the mummy. I always love the blindfolded put your hand in the cooked spaghetti to simulate brains trick. I love this set, even though the ghastlies were cute, too. We don't have a set tradition, but quickly trick or treat so we can see all the little ones in their costumes get their candy from us. My favorite Halloween tradition would be... our Halloween dinner. Having the family together, enjoying each other and the crazy food. Always a good night. My favorite thing about Holloween is having all the kids in their adorable costumes stopping by for candy. My family doesn't really have Halloween traditions, but I love visiting the houses of other people who go all out decorating for the kiddos! Selecting the perfect pumpkin, of course! That begins not only Halloween, but the perfect Fall Season!!!! So cute! I love EVERYTHING about Halloween. My favorite tradition is getting together all of the kids I know (in costume) for homemade chili dinner. It's always lots of fun. I love looking back at the pictures of our annual event! Thanks for the fun! 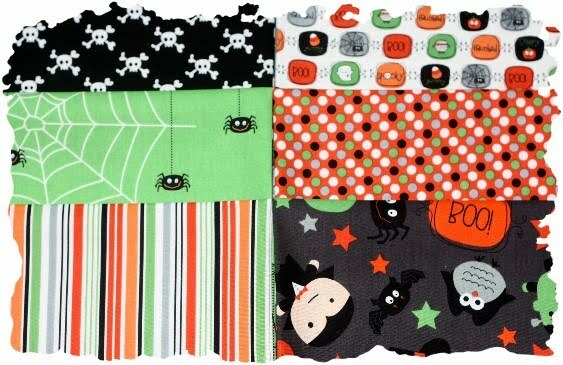 I love the whole kit and kaboodle about halloween. I love picking out pumpkins at the patch, carving, eating roasted pumpkin seeds, trick or treating, candy! seeing my kids dress up, people trying to spook! halloween is my favorite holiday. My favorite Halloween tradition is carving two pumpkins. One Bert and one Ernie :o) We've been doing it ever since I was a little girl! I love the little mummies! Adorable! I love the picking of pumpkins...last year we even grew our own. That was an adventure! I don't know that we have a special Halloween tradition -- you dress up, you go trick-or-treating, you get candy. Oh, you know what, my siblings and I would spread all our candy out and try and trade for the good stuff. My kids do the same thing now. I hear them wheeling and dealing in the dining room afterwards. Our past tradition was to decorate the door, leave the ourdoor lights on, and let the visiting kids select their own candy. After we moved, we began a new tradition. My brother fills a trailer with hay and pulls it behind his truck. Neighborhood children with parents are invited for a hot dog and marshmellow cookout at his barn. Then, once is dark, they load up for a hayride and drive around through fields to our house. We have all the lights off and go out, circle the wagon, and howl at the kids/parents. Then, we let them select candy. Can you picture two old women howling? We do a good job too because the kids start howling. After all is done, they continue on their hayride trip (now howling) through the fields and return to the barn. It is good fun without costumes or anything that would scare little ones. Please enter me in your giveaway. I love giving out candy to the kids and seeing their costumes. The little ones are the best, so proud of their costume! Fav tradition-singing Pumpkin Carols! We have a Peanuts booklet with all sorts of Christmas carols but the words have been changed to fit Halloween! I love taking the kids to the pumpkin patch...I like plain ones, no carnival rides. I hope to find a "pick your own" this year. 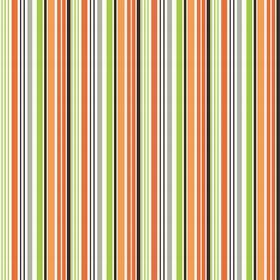 Yeah I did not care for last weeks fabrics. But I love these! so cute. We always have a party at church and it's always so much fun to go and "trunk or treat"
Picking the candy for the treats because I get all of the leftovers. Caramel apples! I always loved making them and then eating them, after rolling them in chopped, salted peanuts, YUM! Started doing it as a kid and am STILL doing it, it's just what makes autumn/fall fun! My favorite Halloween tradition is sorting candy! I love it even as an adult. My favorite Halloween tradition is going to the pumpkin farm with our three kids to get pictures. It's also when our twins celebrate their birthday (middle of October) so it's always nice to send some new, cute Halloween pictures to our families and friends. My favorite is watching all the old classic monster movies, Dracula, Frankenstein, Wolfman, Mummy, Creature from the Black Lagoon! Fun fun fun! love this line...so cute! my favorite thing is seeing all the cute kiddos costumes! My favorite Halloween tradtion is the annual costume party with my church! We all try to one-up the best from the year before. My favorite Halloween tratdition was making my daughters costumes, and going to the parade in town. Well my girls are all grown, now I love having my granddaughters come to my house, Mimi's house is the last stop, it's fun watching them pose and show off their costumes and go thru all their goodies. love halloween just made today a skeleton wall hanging. cool. I love halloween because 1 my birthday is 5 days later. and because the decorations can be so dramatically different from house to house. traditionally speaking I just love every thing about it and well every oct 1 the decor comes out. sometimes earlier. didn't see a winner, so I'm gonna sneak a comment in!! I love the costume making best of all! !